Is your child overweight or obese? If you are the parent of a boy or a girl who has a bigger body, you probably worry about their long term physical health and emotional wellness. You may have discussed the issue with your child's teachers or other parents at your school. Perhaps you have encouraged your child to lose weight. But navigating the issue of weight loss is very tricky when you're dealing with a growing child. Your pediatrician is always the best source for health advice when it comes to your child. But there are also tips and guidelines from other medical and health experts that can help you to build a base of healthy habits in the home to support good nutrition and an active lifestyle. Should You Worry About Your Child's Weight? Busy parents are under a great deal of stress. Moms and dads help their children manage academic challenges, deal with peer pressure, and learn basic organization skills. But parents of overweight children have an added burden. In the midst an already overloaded schedule, they may feel pressure to help their overweight child lose weight. And that task adds can add even more anxiety to a hectic home life. If that overburdened scenario describes your family, you should know that you are not alone. The statistics about childhood obesity are staggering. According to the Centers for Disease Control and Prevention, the number of overweight children has doubled in the last 30 years, and among adolescents, the number has tripled. And while you might be tempted to ignore the problem and hope it goes away, there are good reasons to rethink that decision. Overweight kids are at increased risk for a wide range of conditions including cardiovascular disease, type 2 diabetes, high blood pressure, and of course, adult obesity. Despite the known risk factors, however, weight loss for children is not always the best solution. Should an Overweight Child Lose Weight? 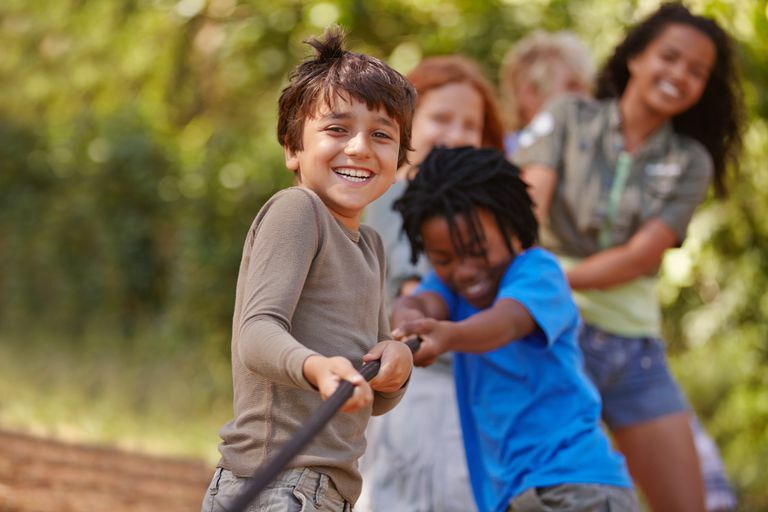 The American Academy of Pediatrics provides guidelines and recommendations for weight loss in children based on the child's age and on body mass index (BMI). BMI in the 85-94th percentile (no risks): maintain weight velocity. After linear growth is complete, maintain weight. To comprehend the guidelines more clearly, it's helpful to understand the term weight velocity. "We define growth velocity as a child's rate of growth in both weight and height," says Monica Auslander Moreno, MS, RDN. Moreno is the founder of Essence Nutrition, a private dietitian group practice in Miami serving both children and adults. Weight velocity is the reason that weight loss guidelines for children are different than those for adults. "Children have the luxury of having vertical growth while adults, if they are not careful, grow horizontally,"says Jarret Patton, MD, FAAP. Dr. Patton is a board certified pediatrician who practices in Pennsylvania. He adds that with monitoring, your child can grow into their healthy weight. "If your child's BMI is in the overweight or obese category, initial efforts should be aimed at weight maintenance, not necessarily weight loss. Remember, your child will continue to grow, so they literally can grow into the proper weight by keeping them from gaining any additional weight. There should be dietary changes which emphasize fruits and vegetables as well as the complete elimination of sugary drinks like soda, sports drinks or 100% juice." Moreno adds that for kids, reaching and maintaining a healthy weight is not just about cutting calories. "The key to adequate growth velocity is eating nutrient-dense foods—specifically, those with protein and healthy fats. Calories are not the whole story at all." Whether your goal is weight loss or weight maintenance, there are different strategies that you can try in your home. Make adjustments as needed to help your child develop healthy routines that lead to an active lifestyle and nutritious eating habits. Lose the smartphone and tablet. With so many video games and smartphone apps to choose from, children are skipping exercise. Physical activity can protect against obesity and can improve posture, sleep, concentration, and self-esteem. Get creative to help your kids move away from their baseball app on their tablet and move onto the baseball field in real life. Make exercise a family habit. Dr. Allen suggests that the family exercise together. If one parent is obese there is a 50 percent chance that their child will also be obese, according to the American Academy of Child and Adolescent Psychiatry. Parents can set a good example for their children by living an active lifestyle. Aim for a minimum of 20-30 minutes of physical activity each day. Adopt a healthy diet for the whole family. Obviously, it is great for children to put down the Xbox controller and participate in sports and activities, but it is a diet that makes the real difference. Focus on quality nutrition rather than simply providing calories. "You can get 600 calories from a donut," says Moreno, "but none of those provide any healthy fat, protein, fiber, vitamins, minerals, or phytochemicals needed for a healthy growth." She suggests making healthy smoothies to 'hide' vegetables like kale or spinach. Add creaminess with avocado tell kids that a green princess or monster created it and it turned green. Moreno also recommends nut butters to provide vital proteins, fibers, fats, vitamins and minerals. Creativity is the key. If you're not sure where to begin, talk to your pediatrician to get a referral to a registered dietitian. Use careful language around weight. Things you say to children about weight can have lifelong negative effects, says Moreno, so it's important to be extremely careful with children. She says the best strategy with kids is to promote healthy offerings. For example, instead of telling a child 'we don't keep ice cream in the house because it's fattening', you offer a healthier yogurt bar for dessert or set out plain yogurt, vanilla essence, berries, cacao nibs, nut butters, nuts, honey, and some low-sugar granola to make a healthier sundae. As you guide your child to a healthy weight, remember to take small steps and make changes gradually. A complete home overhaul is likely to be stressful and short-lived. If you're not quite ready for a full-scale program to help your child lose weight, make small changes to improve your family eating and exercise habits. You can even make simple design changes in your home to promote better health. Stay on track with help from your pediatrician and from weight loss coaches or school counselors. Dr. Abigail Allen. Email interview. March 25, 2013.